I like everything except the hoodie. Is the god of thunder scared he might catch a cold if it rains? Ooh, it’s starting to sprinkle! I better take off my really cool helmet and pull up my hoodie! Dude, the hoodie rocks. Although I admit I don’t quite see how it works, practically speaking, with the helmet — having it under the helmet seems like that would make the helmet not fit, but if you tried to put it over the top, the wings would get in the way. But I like how it fits better with the idea of an actual warrior from the cold and rainy Northlands, it seems very Norse to me. I’m guessing he’s going for the chainmail under helmet type look and running with it. Diggin’ it. That redesign is sweet. I think the biggest plus is the simplicity – it retains all the right visual cues with a slight twist. 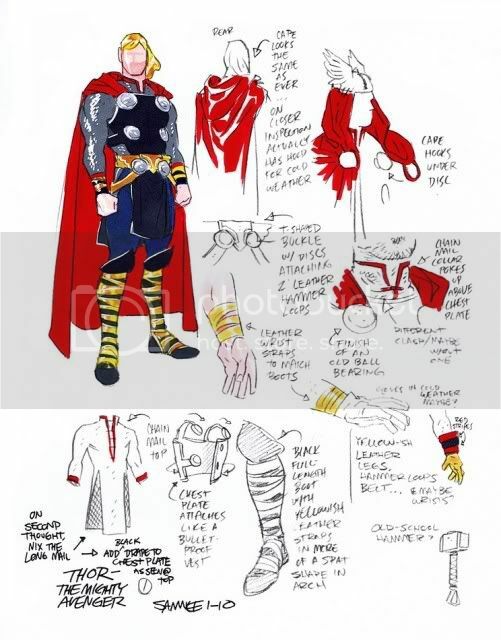 The stink of the stupid over-the-top-mega-Thor armor of the 90s is nowhere to be sniffed. Verily, this art good! well there is only one thing that bugs me about the avenger version of Thor, the fact that he is blonde while in norse mythology he has red/brown hair and had a very thick beard.